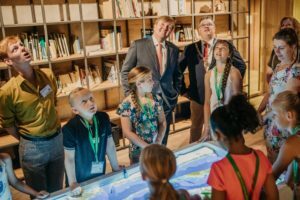 As part of 'Nijmegen European Green Capital 2018', His Royal Highness Willem-Alexander, together with students from the eco-schools, visited the SandBox display. This is an innovation from Deltares that uses kinetic projections of water on sand to show the impact of an intervention on a river or coastal area. The projections on the sand are linked to a Delft3D FM hydrodynamic model that can produce forecasts of water levels and currents. All man-made changes in coasts and rivers can be simulated by moving the sand around and letting the model do the calculations. This can be done in ports, for nourishment operations such as the Sand Motor or with tidal flows in the Wadden Sea. The main benefit is that the impacts are immediately apparent to non-researchers.